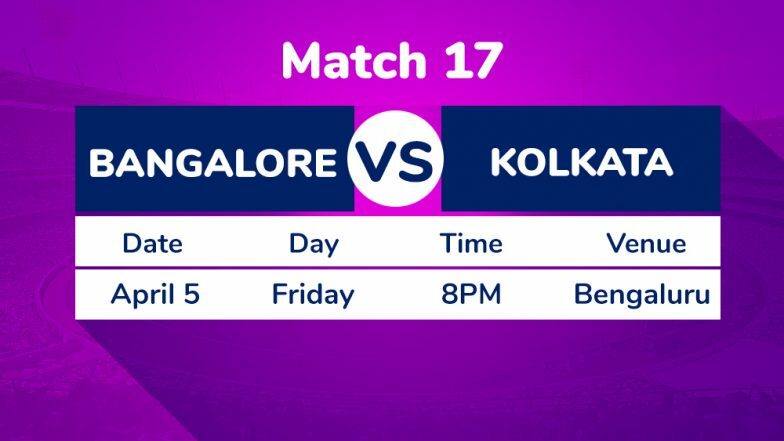 Bengaluru, April 4: Down in the dumps after failing to win a single game from four attempts, Royal Challengers Bangalore (RCB) will have to put it across Kolkata Knight Riders (KKR) to not drift further away, when the two sides lock horns in an Indian Premier League (IPL) clash here on Friday. After four games, they are yet to win any and have also been poor in every department under India captain Virat Kohli. RCB Team in IPL 2019: Schedule and Squad Analysis of Royal Challengers Bangalore in VIVO Indian Premier League 12. Royals recorded their first win against them as leggie Shreyas Gopal bowled brilliantly to dismiss Kohli and AB de Villiers with delectable googlies. KKR Squad in IPL 2019: Team Profile, Schedule of Kolkata Knight Riders in VIVO Indian Premier League 12.